For some, a mismatch of skills remains despite having taken courses aimed at helping them switch, said hiring experts. Mr Stephen Tan, director of talent management at Hudson Asia, said: "One of the major changes we have seen is the rise of the contingent workforce and the gig economy. "While we have seen millennial workers grow rapidly in this sector, Gen X-ers and baby boomers are lagging behind." One reason is that this older demographic typically has more obligations, such as home loans. "Therefore, they tend to look for permanent employment and a stable source of income - contract and ad hoc work does not provide the certainty," he said. These challenges remain despite more courses to help those making a mid-career switch. Last month, Second Manpower Minister Josephine Teo said the number of people attending the Professional Conversion Programme (PCP) has risen to 1,500 in the first half of this year, compared with 600 in the same period last year. It caters to professionals, managers, executives and technicians. Mrs Teo said this was partly due to the rise in the number of PCPs available. Today, there are 87 PCPs across 34 sectors, compared with 37 in 18 sectors a year ago. The proportion of mature PMETs taking part in the PCP has also risen from 20 per cent last year to 30 per cent this year. Even so, reskilling does not guarantee a well-paying job, noted Mr Paul Heng, managing director of NeXT Career Consulting Group. He said few workers aged between 40 and 60 look for a fresh start: "In most cases, it is not economically viable as they have to take a pay cut." "For many, even if they train themselves in a different skill set, they are competing with a fresh graduate with a similar skill set but who might ask for only half the pay." Another barrier is the poor impression some companies have of older workers. 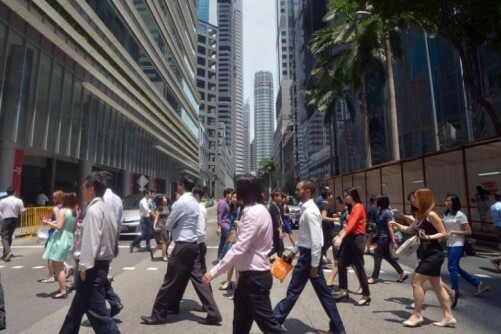 "Employers may harbour the perception that older workers may be slower to pick up new skills and less productive than younger workers," said managing director of Hays Singapore Lynne Roeder. Companies should relook their hiring practices, said experts. Mr Ian Grundy, head of marketing and communications for Asia-Pacific at The Adecco Group, said the recruitment firm does not record the candidates' ages on the belief that is it "not important to their ability to perform a job or function". On the bright side, Mr Heng said he has observed some hiring managers become more accepting of mature workers.